Sweet! with that ol’ Lagunitas hoppiness and spice. 2015 limited edition. 10.6 ABV. 22oz. bottle. I probably review more barelywines than the average beer drinker ever drinks in a lifetime. I admit, I am searching for a easily accessible replacement for The One. So please indulge me as I review yet another bitterly sweet high-alcohol barleywine. I tell you with pure intentions, once you get into the barleywines, nothing is the same. 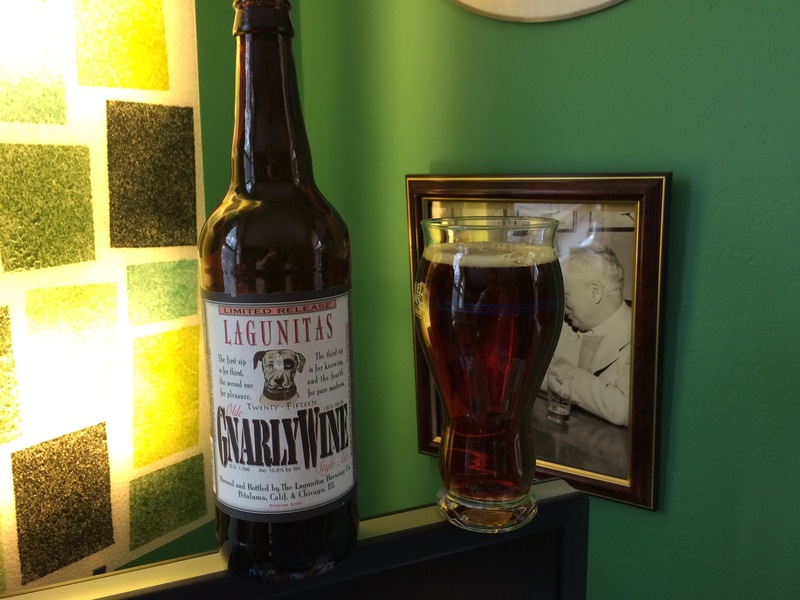 I approached the Lagunitas Olde GnarlyWine with trepidation. Unlike many of my peers, I haven’t found a Lagunitas beer that I enjoyed. Its beers are consistent, for sure, displaying a hop spice that just overwhelms me. Whatever it does, it does well, but it’s just not my wheelhouse. But I’m not one to pass up a chance for that barleywine experience. The nose got me worried. I sensed that copper flavor that is endemic to many barleywines. It’s something I’ve resigned myself to, as it seems like it’s a usual accompaniment to the process. (Not The One, of course. Never The One.) So my first sip came as a surprise. There was intense sweetness in the malt—candy sweet. That Lagunitas hop blend was lurking in there, too, but the malt slammed in first, blending excellently with the bitter hops beneath. I thought the sweetness was too intense at first, but each sip became more relaxed as the hoppiness built up a nice foundation to complement the malt. Here is a Lagunitas that I can enjoy. Of course, it’s a limited release, and it’s not even on the Lagunitas website. So I doubt I’ll have much more time to enjoy it. It’s not The One, but it’s in the ballpark, which is all I ask for. I found the 22oz. for $5, too, so it’s extremely reasonably priced. And after consuming the bottle, everything becomes a little bit fuzzy, a little bit sweeter, and that’s a gift I’ll always treasure.